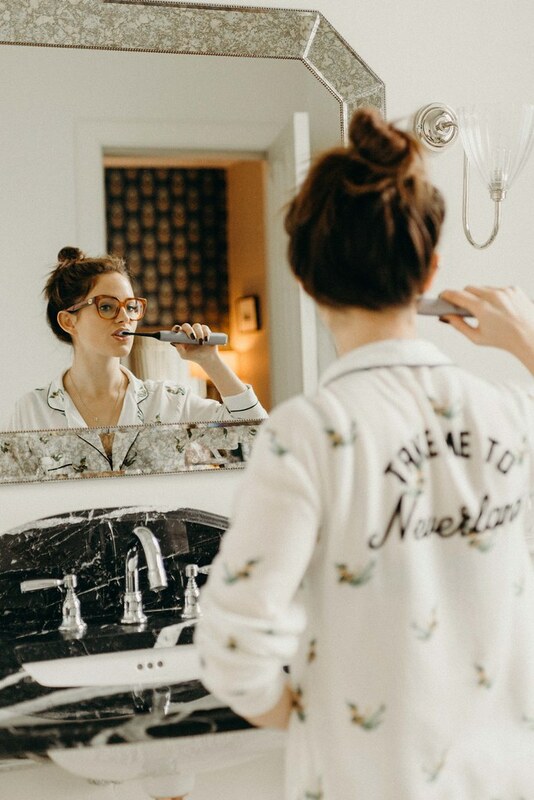 The Little Magpie: My Current Morning Routine! Hello friends! 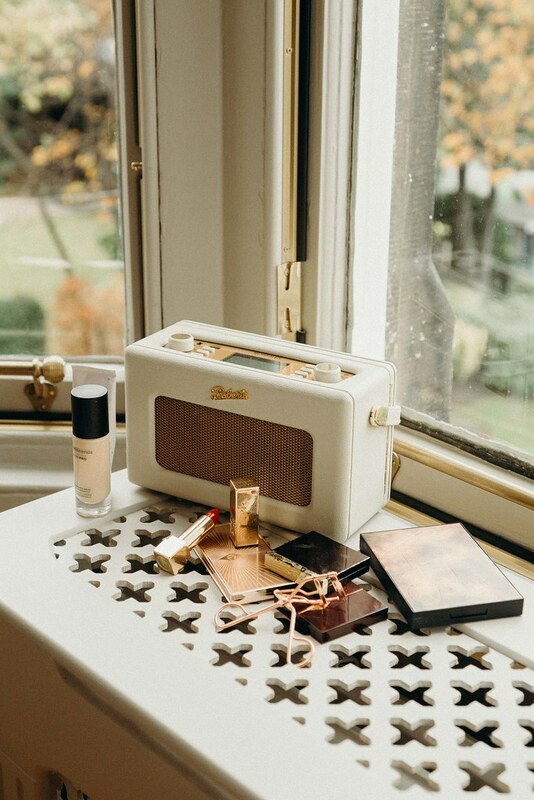 Today's post is a little updated morning routine for you, because it's been a while hasn't it? I thought I'd talk you through what I get up to in the morning and introduce to you a super snazzy Philips toothbrush whose presence has been gracing my bathroom as of late. But more on that soon! So I know that, initially, an app to help you brush your teeth can sound a bit 'Argh!' intimidating, but I promise you it's super easy and if I can do it you can do it. All you need to do is download the free app from the store, hook your toothbrush up to your phone via bluetooth and - hey presto! - you're ready to go. From there you can set yourself focus areas of your mouth to look after specifically (say there's an area that's suffering from plaque build up or gum recession) and the app will ensure they are kept clean. You can also set yourself goals like 'gum health' or 'whitening' - or even 'bad breath' - and the app will work towards helping you achieve these as well as telling you when you need to slow down or apply a little less pressure whilst brushing. You're given progress reports throughout so that you can see how you're getting on and how you're improving so make sure to keep some stickers to hand so you can reward yourself. Overall, it kind of makes teeth brushing a little more fun, as well as more engaging and effective, rather than the usual standing on the spot and forgetting who you are for two minutes. 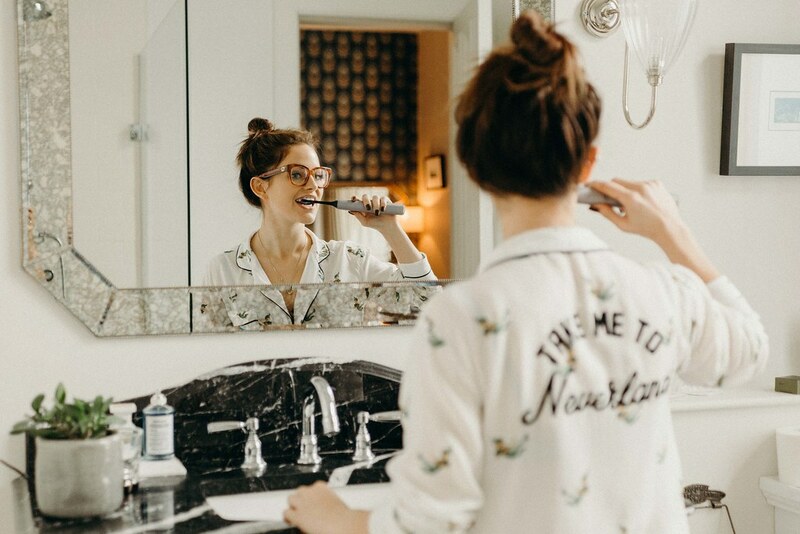 In fact, it's like having your own at-home dentist right there with you guiding you on how to get the best brush (without having the weirdness of an actual dentist standing over you while you brush every day shouting 'go slower!' and 'I said LONGER on the left hand side, Susan'. Pretty amazing, isn't it? It looks like I'm not wearing any pants, doesn't it? I apologise. So, first up, I wake up. Yes, you heard it here first. Then I snooze my alarm for as long as is humanly possible, try to find a valid reason not to get up and, finally, get up. 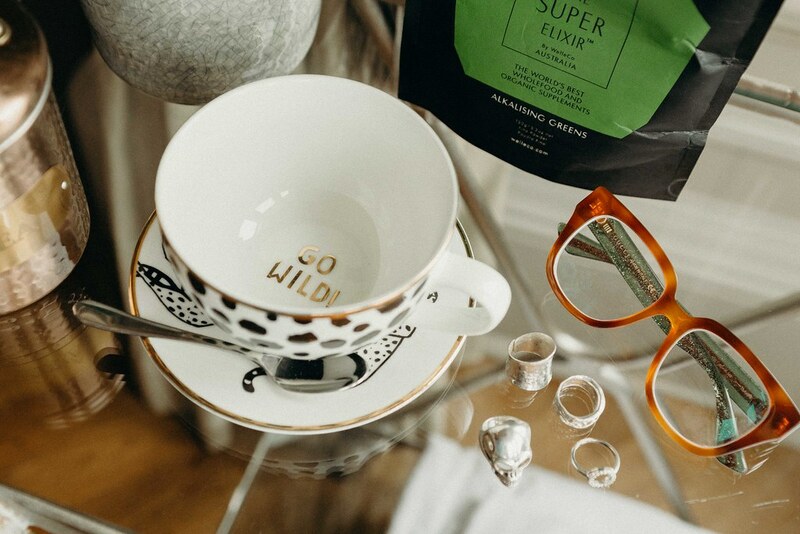 Recently I've been starting the morning with The Super Elixer Super Greens powder, which is made by Elle Macpherson's company and is kind of an 'all in one' multivitamin in powder form. I normally have it with almond milk rather than water as it find it tastes a little better that way and, honestly, am fully converted. If it's good enough for The Body, it's good enough for me. Next up I'll have some brekkie - normally something absolutely wild like peanut butter on toast - and then onto the 'making myself look acceptable for the rest of the world' phase. First up: toof brushing. We all know I'm big on toothbrushing - I've spoken about it on many an occasion - but I honestly think that happy gnashers = happy life. I'm a huge, huge fan of the electric toothbrush and, now that I've used one for a few years, I couldn't go back to a manual one. That's right, I've become a toothrush diva and I'm not ashamed to say it. Truthfully though, the difference in your teeth after using an electric one is mahoosive. The most recent toothbrush I've been using is the Philips Sonicare DiamondClean Smart, which has been dubbed, 'The Rolls Royce' of the toothbrush world. Ooh-er, I know. Similar to ones I've spoken about in the past, it comes with an accompanying phone app which, as well as being one of the best and most concise ones I've used, I ruddy love; it makes looking after your teeth so, so much easier. Basically what the app does is keep track of your 'brushing behaviour', if you like, in between dentist's visits. It'll coach and guide you along the way using smart sensor technology so that you can make sure that you're looking after your mouth as best as you can. However, one of my favourite parts is - wait for it - the charging glass. I know, you probably didn't see that one coming, did you? The charger is actually that little glass tumbler you see above! My current electric toothbrush - which, don't get me wrong, I love dearly - needs to be dismantled and popped in a little charging box to charge the battery. 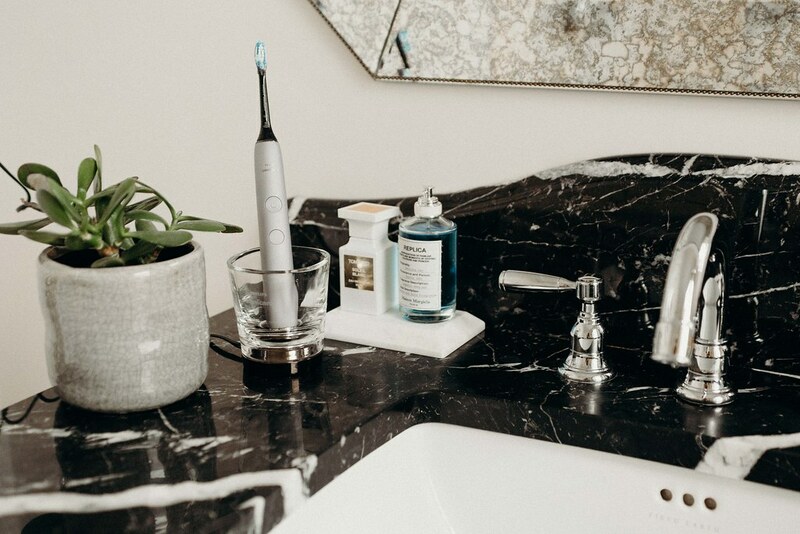 With this one, however, you simply plug in the charging base, pop the glass on top, and any time your toothbrush is put in the glass it'll start to charge. I'm assuming most of us keep our toothbrushes in some sort of tumbler anyway, right? So there's literally no thought involved at all or having to actively remember to charge it. Can you tell I've been caught out with this many a time? Genius. It does also come with a charging case, that can be juiced up via USB - so that you don't need to take a glass tumbler with you if you're going on holiday or away with work etc. The brush also comes with different heads and each does its own thing; there's one for plague defence, one for gum health, one for fresh breath (goodbye last night's onion and garlic risotto dish) and one for whitening. And, of course, our ole friend the app will remind you when you need to update them. Seriously, I'm yet to find anything wrong with this wonder of a toothbrush. Apart from that it makes me feel a little inferior intelligence-wise. Now, I know the one thing that can put people off electric toothbrushes is the price. 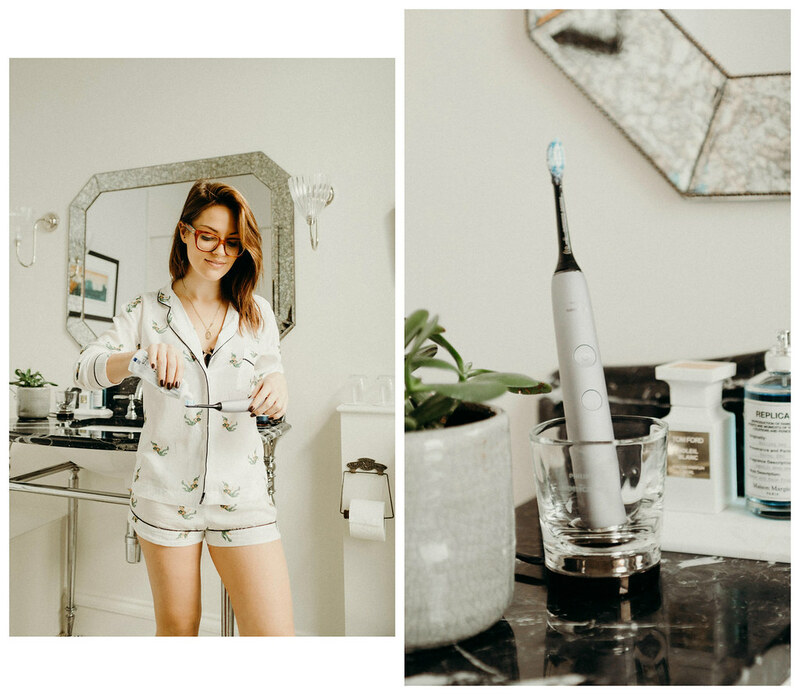 I've been given a little discount code which will get you 10% off and it iiiis - drumroll please - BRUSH4 and it can be applied at checkout on the Philips UK store here. So that's worth keeping in mind if you'd like to pick one up either for yourself or for a wee loved one this Christmas! So, after I've done my teeckles I shower and move onto toiletries. 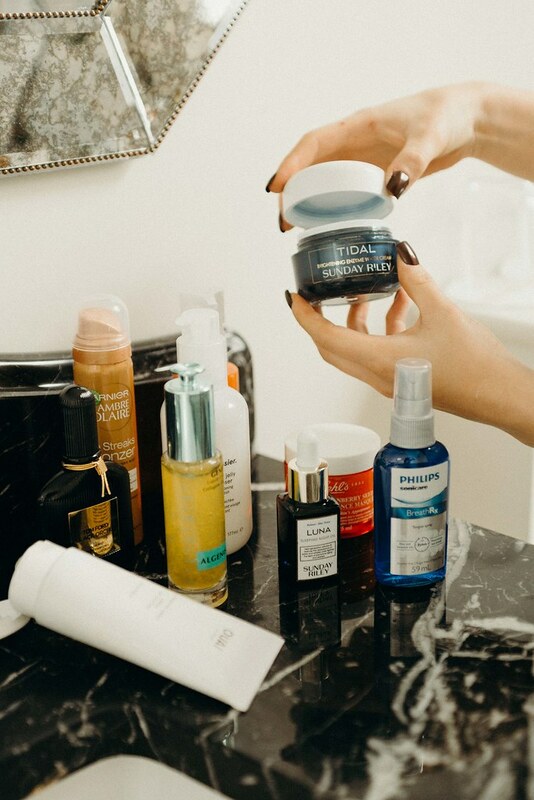 A couple of cleansers I've been loving as of late are the Glossier jelly cleanser and the Oskia Renaissance cleanser but I'll go into all of those in more detail in a separate beauty post! I'll apply some Sunday Riley tidal moisturiser and then move onto the ole make up. I already had most of it done for photo purposes here - I didn't want to put you through having to see a more accurate depiction of what I look like when I wake up - so it would normally be a much longer a process. Last but not least, I dress. My least favourite part. Seriously, now that Winter has arrived I could quite happily stay in my jammies all day. But, alas, it has to be done. And there we have it.. I am ready to rumble. 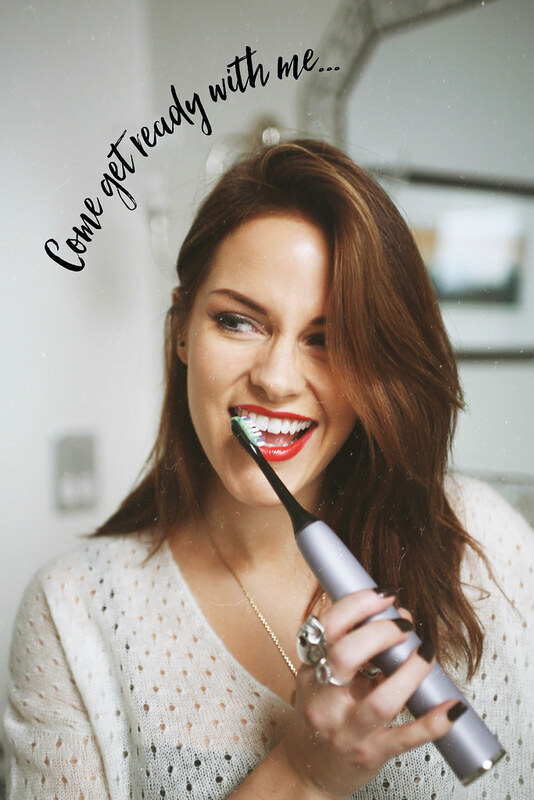 I hope you liked this post, I honestly do think that this is one top notch toothbrush - I take my teeth v seriously so I wouldn't recommend anything that's not amazing. 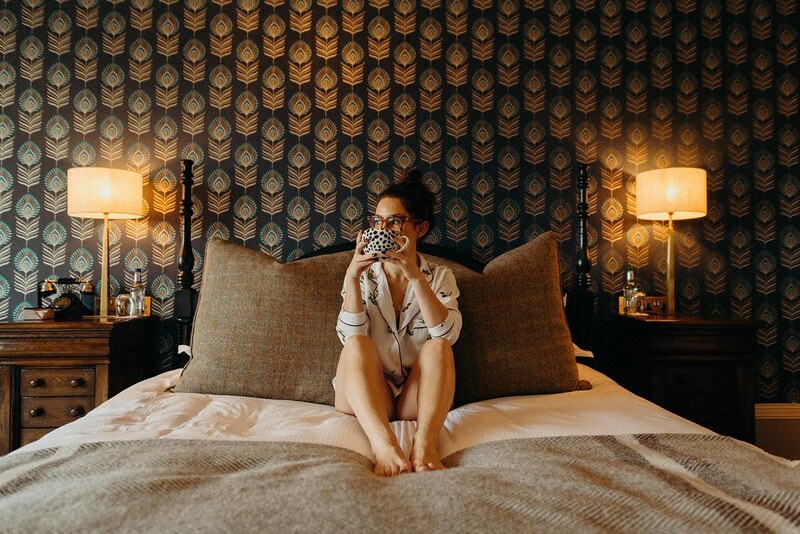 I'd also like to say the biggest thank you to the beautiful, beautiful Dunstane House for letting us use one of their suites to shoot in! 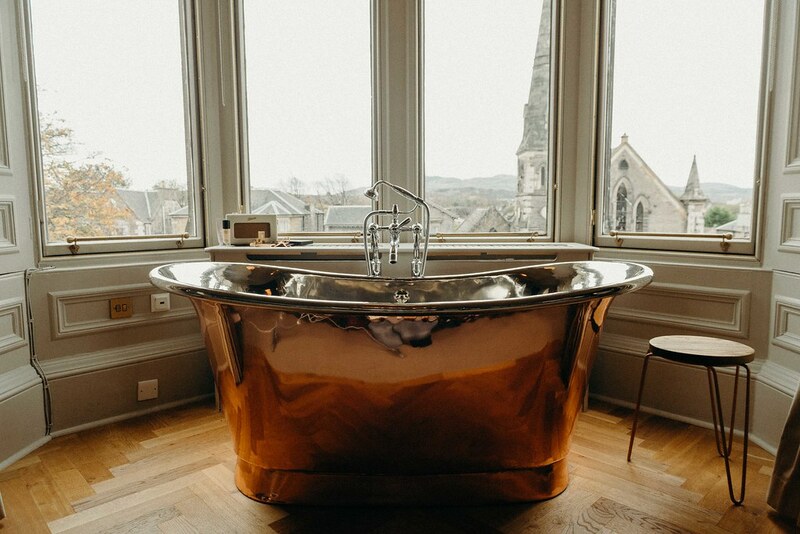 Just look at that bath. That bathroom is goals!! This is also a good routine. That tooth brush sounds really good. Gosh, such stunning photos! Beautiful portraits, I actually love your glasses and pyjamas. And what a cool bathroom! The toothbrush sounds really fancy, they're definitely taking "brushing your teeth" to the next level. Omg these shots are stunning!!! !